This weekend saw Heroes Centre Ambassador Gordon Reid make tennis History. 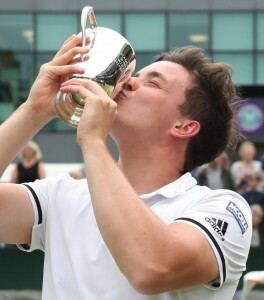 What made Gordon’s victory all the more remarkable was that it came less than 24 hours after he and partner Alfie Hewett had taken the Men’s Wheelchair Doubles Title by beating number one seeds Stephane Houdet and Nicolas Heifer of France 4-6, 6-1 7-6 in an absorbing match that lasted 2 and half hours. And if that wasn’t enough to sap Gordon’s strength the night before his greatest game, it also transpired he had a troubled night having had to find a new hotel room to avoid late-night revellers “I was staying at the National Tennis Centre the last two weeks. There was a party on last night that went on till one in the morning. I ended up moving hotels at 10 o’clock last night and escaped the noise,” Gordon later revealed to the press. Our sincere congratulation to Gordon – a truly remarkable and inspirational sportsman.